BilliB the clock specialists offer the ELISE Grandfather Floor Clock, a very distinctive grandfather long case clock crafted with the rich interplay of select woods and veneers. Classic detail reigns, in stately pilasters in zebrano wood framing the large bevelled glass door allowing you to see beautiful brass/gilt movement supports polished pendulum and weights. Two very useful bottom drawers and exquisite mother of pearl effect dial with moon disk and second hand. 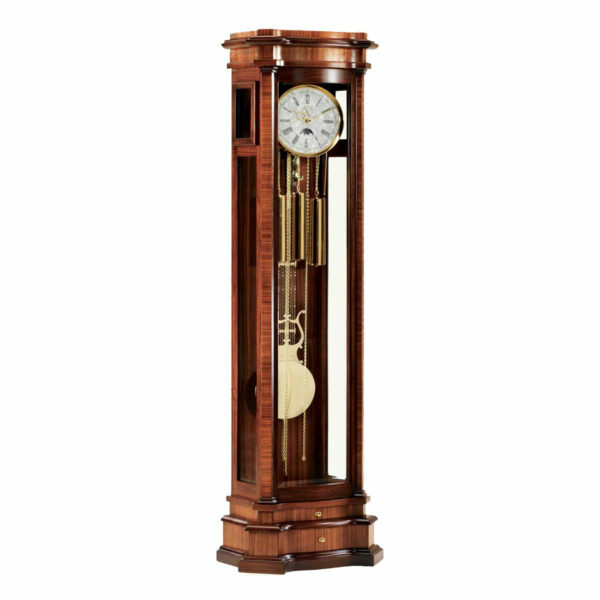 The ELISE Grandfather Floor Clock is shipped direct from Hermle in Germany; it is secured by Clocks & Chimes to meet a specific order and is not a stock item that can be returned.